Broilers are chickens grown and bred for human consumption. They are typically used for frying. Depending on the body weight, broiler chickens are marketed when they are between 4 and 10 weeks old. They are available in grocery stores and are widely used by fast food restaurants for making sandwiches and nuggets. Broiler chickens can be easily reared at home and require about one square foot of space per bird. Flocks can be grown in small buildings. Garage corners are suitable for raising a small number of chicks. These birds are usually raised in a confined area, although they can be given limited access to a fenced compound or yard. Keep the surface of the broiler pens free of sharp objects and other harmful items. For bedding, use a non-slippery material that can absorb moisture and prevent bacterial growth. Smooth and slippery bedding, like plastic and cardboard, can cause leg deformities in the chickens. The best bedding materials are cane fiber, peanut shells, rice hulls, wood shavings and ground-up corncobs. Avoid using straw and hay. 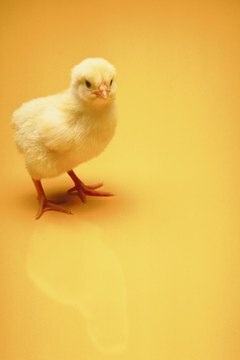 Broiler chicks do not produce adequate body heat during the first few weeks of their lives. A heated area for raising fowl is known as a brooder. Make sure there is an external heat source and ample space so the chicks can move toward or away from the heat. If you are brooding a small number of chicks, infrared bulbs and electric heat lamps are some of the recommended heat sources. For brooding 50 chicks, you need two 125-watt infrared bulbs. Make sure the birds cannot come in contact with the bulbs. The growth of the chicks' feathers will be harmed if the brooder is too hot. Secure and suspend the lamps at a height of about 18 inches above the ground. Make sure the water pans are far enough from the lamps so any splashes won’t crack the bulbs. You need to have spare bulbs ready to immediately replace lights that burn out. Since the chickens outgrow the brooding period in a few weeks, you need to slowly move the lamps up about 2 inches every week until they are about 24 inches above the ground. Once the broilers are about 3 to 5 weeks old and the feathers are fully developed, you can remove the external heating source. For the first couple of days, use a shallow pan to feed the chicks. Once the chicks grow a little bigger, you can use a long wooden box to hold the feed. Start the chicks with a 23 percent protein grower diet and continue using this for the first four weeks. Thereafter, feed the chicks with a 19 percent protein grower diet. Do not feed the chicks scratch feed, greens or eggs, as this may slow their growth. Make sure there is ample drinking water. Check the waterers regularly to make sure they are free from litter. Change the water at least once a day. How Much to Feed a Duck? Do Hens Feed Their Chicks at Night?